What new research says about children and screen time. 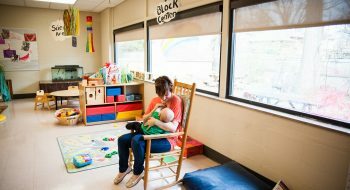 We looked at the latest research, as well as recommendations from NAEYC, the Fred Rogers Center and the American Academy for Pediatrics, and this is what we found. What experts recommend for early childhood professionals . A child’s use of media and technology should invite and enhance interactions and strengthen relationships with peers, siblings, and parents. Co-viewing and active parent engagement. Using media together improves learning. Talking about what the child is seeing and doing, and connecting what is on the screen with real-life experiences, builds language skills and vocabulary, encourages interactions, and strengthens relationships. Technology should be used in ways that support positive social interactions, mindfulness, creativity, and a sense of initiative. 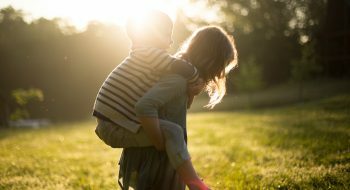 Technology use should not displace or replace imaginative play, outdoor play and nature, creativity, curiosity and wonder, solitary and shared experiences, or using tools for inquiry, problem solving, and exploring the world. The quality of what children watch on screens is more important than how much they watch. 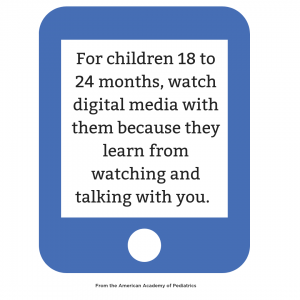 Young children are moving from being media consumers to media creators. New digital tools provide the opportunity for making and creating at their fingertips. In the digital age, technology tools can improve communication between home and school, making it easier to exchange information and share resources. Engaging families improves outcomes for children. As the primary role models for technology and media use, adults should be aware of and set limits on their own technology and media use when children are present and focus on children having well-rounded experiences, including moderate, healthy media use. Pre-service teacher education and in-service professional development are needed to provide educators with the media literacy and technology skills to select, use, integrate, and evaluate technology tools for young children. 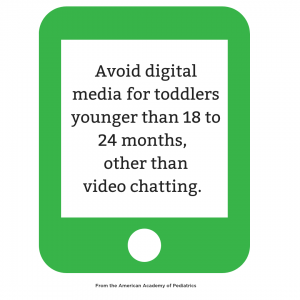 Young children need trusted adults who are active media mentors to guide them safely in the digital age. Perhaps not surprisingly, these takeaways elaborate on a key point in the joint position statement: “Early childhood educators always should use their knowledge of child development and effective practices to carefully and intentionally select and use technology and media if and when it serves healthy development, learning, creativity, interactions with others, and relationships” (NAEYC & Fred Rogers Center 2012, 5). For families: this website can help families meet media use goals and learn about what will work best for them: HealthyChildren.org/MediaUsePlan. Want to share tips with the families you serve? See a family-facing version of this post here.